Not To Syn Is A Sin! 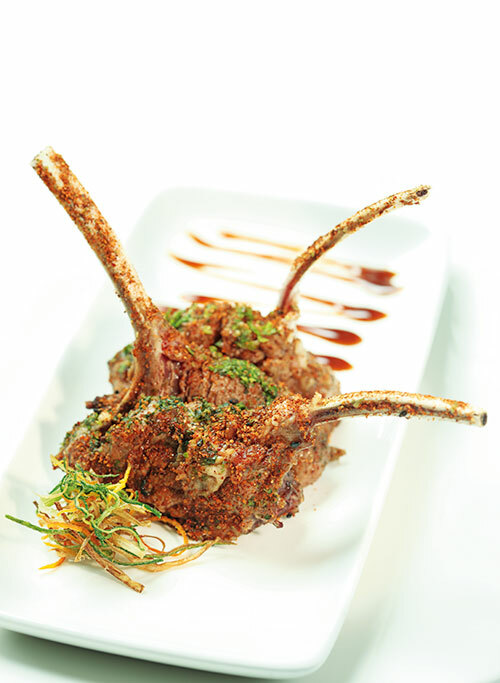 In Hyderabad, chefs Sachin Joshi and Midday Juancho blend the flavours of New Zealand lamb chops in creations that erase geographical boundaries. Vinod Advani gets greedy…. The rich, dark blue tones of soft lighting in Hotel Taj Deccan’s restaurant Syn have a soothing effect. It takes three visits on my part to analyse and then appreciate the clever layout of this uber-cool Hyderabad hangout. And hang out or drape yourself (if so be your inclination) you certainly can. Whichever of its two glass doors you choose to enter in from will bring you face-to-face with its first temptation: the round bar inside at which smartly dressed and even more smartly spoken bartenders will serve up their special vodka martinis. Syntini is what they call them in Syn. On the first evening of my arrival in Hyderabad, in the middle of the Ramdan Period, I am gently persuaded by my two hosts (about whom more details later) to drink the Wasabi Syntini. I do as bidden. It has an almost instant effect. My toothache starts going to sleep. It’s one of those tricks that fate plays. Having planned a four-day weekend at the Taj Deccan to expressly sample its chef’s famed cuisines, one of my molars has decided on a root canal service! And on arrival I am whisked off to meet the hotel’s neighbourhood dentist. A young Hyderabadi lady with an American accent who while drilling and swabbing, takes the opportunity to list out her top three restaurants where I simply, “must sample the haleem, if you are a food writer!” That story will continue another time. Right now, it’s time to meet my hosts. 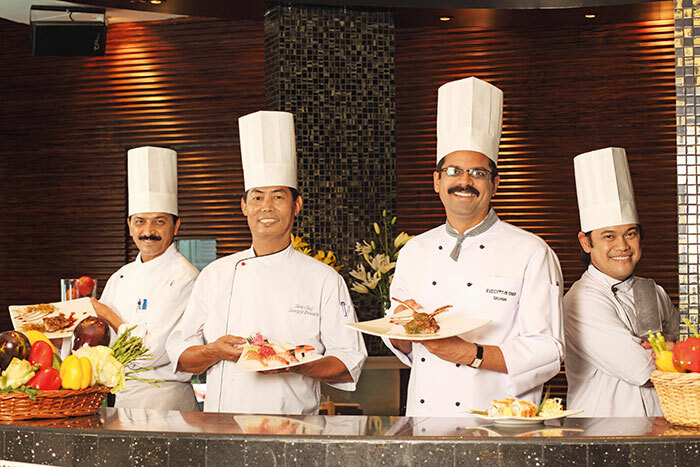 Executive chef Sachin Joshi could be mistaken for a lawyer with his determined chin and focused gaze. Food and beverage manager Devraj Singh left his small-town roots to pursue a calling in the hospitality industry. Both men united in their passion for food. Each sitting on both sides of me at the bar, determined that the start of my root canal digging will lead the way to a gastronomic journey. Am I brave enough to choose one? Going bravely against Hyderabad’s cardinal commandment of cuisines – Thou shall not experiment – Syn the restaurant invokes, indeed encourages another absolute no – no. Thou shall (not) be greedy and therefore thou shall (not) sin. The Grand Master of such seduction is our tall, debonair chef from Pune whose calm gait and even calmer demeanour mask his devilishly delicious intentions. Chef Joshi is not alone in this. 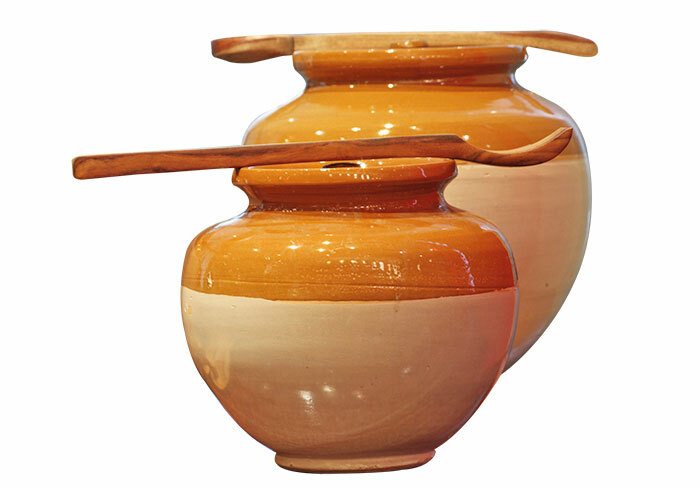 This culinary revolution is taking place in most Indian metropolises. A revolution in youngistan’s eating sprees, exploring hitherto unknown cuisines, drinking new world wines, happily gorging on blends and fusions. In almost calculated synchronicity (call it another Syn), young chefs are feeding, fostering, fomenting this culinary revolution with their ideas. Ideas born out of solid hospitality schooling combined with a sense of adventurousness to serve up tasty fusion food. Most are in stand-alone restaurants. Some are in five-star hotels like the Taj Deccan, whose Syn, almost a year old, has drawn me to sample its offerings. As well as to check out what two culinary maestros from dramatically different backgrounds can do to generously-sized New Zealand lamb chops. Lead them to the slaughter or unmeekly turn them into greedy gulps! And so on to the cooking for this jugalbandi shoot. Like a painter pensively staring at a half started canvas, chef Joshi examines the Thai herbed Lamb Chops. From a squizzy bottle he drizzles a stream of oyster sauce in a zig-zag line. And voila! A quick critical appraisal from all angles and the dish is ready to be photographed. (And eaten! Later, oui). Watching Joshi watch his culinary creation is for me a pleasure. Given my penchant for attention to detail and witnessing a similarly inclined chef leads me to another thought. Master chefs are not just chefs or cooks anymore. 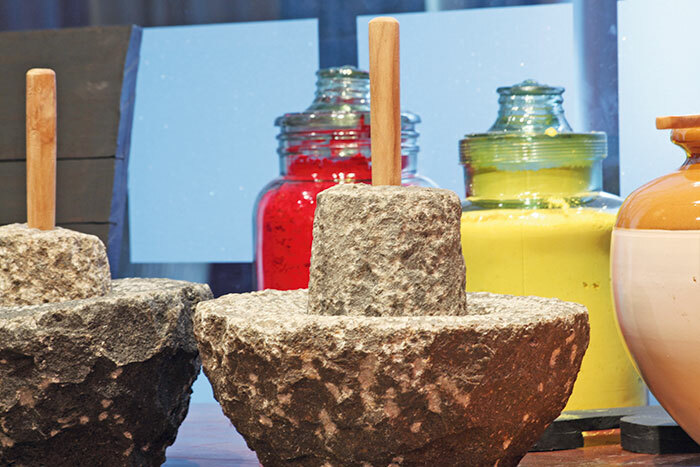 In addition to experimenting with spices, herbs and condiments from across the world, in addition to creating new recipes that are blends of time-honoured traditions and a brave new world of possibilities unlimited by geography, they are exploring their visual aesthetic sense. In simple terms, this means that the food should first please your eye and then satisfy your appetite’s dictates. Satiating many wealthy palates is a short man with a big talent. His name is Midday Juancho, he was born in the Philippines and in the short span of one year, has accumulated his own addendum of admirers. Two nights in a row I watch fascinated, as Midday greets diners who come and sit at the Teppanyaki grill (also inside an oval setting on the other side of the bar) , and stirs up their favourites. Like shrimp, okonomiyaki, yakisoba, and monjayaki. If you are a Teppanyaki fan, you will know that it originated in the kitchen of the fabled Japanese steakhouse, Misono, in 1945. Since then it has taken the world by storm, including Hyderabad. For Verve, Midday gets cracking with his preparation of New Zealand Lamb embellished with Thai basil and spices. 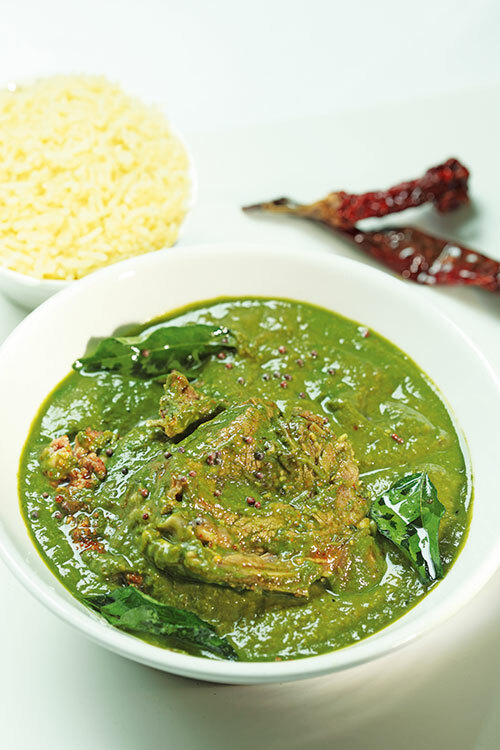 Sachin has finished cooking his Gongura Mamsam version of New Zealand Lamb with Roselle leaves. After the shoot, the indulgence. With the Thai Lamb I choose to drink light Sauvignon Blanc and with the Andhra Lamb, a Chilean blend of Cabernet Sauvignon and Merlot. As expected, both pairings work and as expected, both the lamb preparations are succulent and seductive. And if you really care, I put on two kilos in my four-day stay at the Taj Deccan, Hyderabad. Thanks, Sachin and Midday! Gongura leaves, 4 bunches; Mutton, ½ kg; Oil, 2 tbsp; Onions, 2 no; Sliced chilli powder, 1 tsp; Coriander powder, 1 tsp; Turmeric powder, 1/4 tsp; Salt, to taste; Green chillies, 20 nos, or to taste; Ginger garlic paste, 1 tbsp; Cloves, 4; Cinnamon, 3-4 pieces. For tempering: Oil, 2 tbsp; Mustard, 1 tsp; Red chilli, 1 no, broken in 2 pieces. Clean and chop gongura leaves. Clean and cut mutton into 1 inch pieces. Heat 2 tbsp of oil; add sliced onion and two slit green chilies. Fry till onion is brown. Add ginger garlic paste and fry. Add mutton, chili powder, coriander powder, turmeric powder and salt. Add water and cook for 25-30 minutes. Meanwhile powder cloves and cinnamon. Clean, chop and cook gongura leaves with reaming green chillies and salt. Cool and grind to a paste. Heat oil; put mustard seeds and red chilli. Add the green paste and fry well. When the mutton is cooked, add the clove and cinnamon powder and fried green paste. Simmer for 5 minutes. Check for seasoning and add salt if required. Serve hot with steamed rice. Lamb chops, 3 pieces; Thai basil, 8-10 fresh leaves; Fresh red chillies, 2-3 nos. 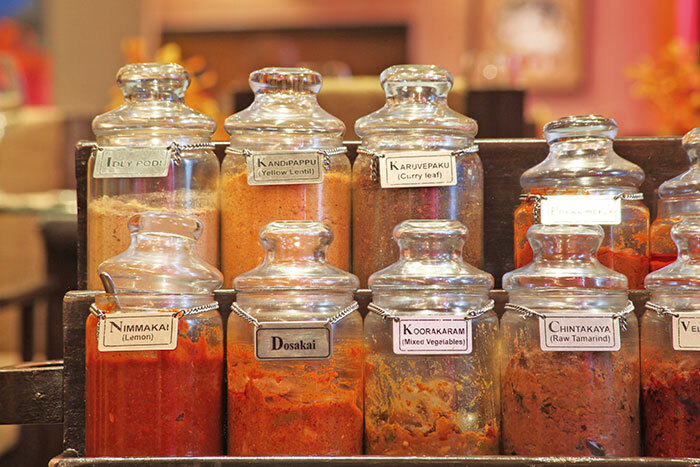 Dry the following ingredients and finely grind to make spice powder: onions, garlic, coriander root, salt, paprika powder, basil, thyme, cloves, black pepper, nutmeg, parsley. Salt, 10gms; Pepper, 5gms; Oil, 2 tsp; Spice Powder, 2 tsp; Thyme, 2-5gms; Thai Basil, 4-5nos. Put finely chopped garlic in oil and sauté. To this add fresh red chilli and Thai basil. Sauté for 2 minutes and add oyster sauce. Add a pinch of sugar. And then add water to adjust consistency. Clean, wash and marinate lamb chops. Grill and keep separately. Arrange the grilled chops on plate. Drizzle some sauce on top and serve hot.